Hawking died at the age of 76 last week after a long struggle with motor neuron disease and was cremated. His ashes will be placed in the abbey, in London, England, between the remains of Sir Isaac Newton, who was laid to rest in 1727, and Charles Darwin, who was buried in 1882. "It is entirely fitting that the remains of Professor Stephen Hawking are to be buried in the Abbey, near those of distinguished fellow scientists," said the Dean of Westminster, the Very Reverend Dr John Hall, last night. Prof Hawking will join other famous scientists in the corner of Westminster Abbey. The remains of Ernest Rutherford, the widely considered the father of nuclear physics, and Sir Joseph John Thomson, who discovered the electron and won the 1906 Nobel Prize for physics, will be nearby. The honor of being laid to rest in Britain's foremost religious monument would have pleased Hawking, considering the stature of the men on either side of his remains. However, he wasn't a theist. "I regard the brain as a computer which will stop working when its components fail," he said in an interview in 2011. "There is no heaven or afterlife for broken down computers; that is a fairy story for people afraid of the dark." That hasn't stopped people trying to claim otherwise. 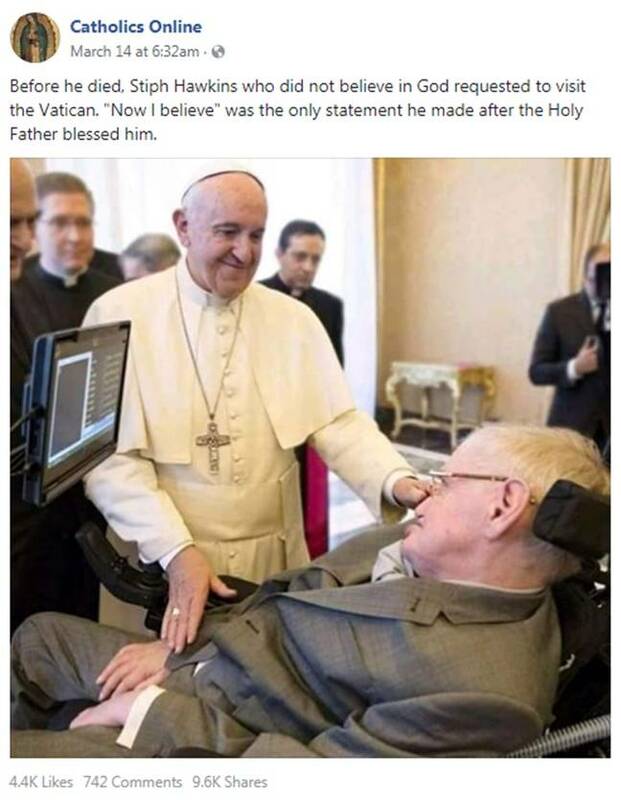 Shortly after his death, a group calling itself Catholics Online posted a picture of Pope Francis meeting Prof Hawking, and claimed that the super-boffin had converted to Catholicism in his last days. Come on Frankie, tell me one of your fairy stories. In fact, the picture was taken in 2016 when Prof Hawking travelled to meet the new pope. He was a regular visitor to the Vatican after being appointed to the Pontifical Academy of Sciences, which seeks to foster greater dialogue between faith and science, by Pope Paul VI in 1968.